Neuropathy means “disease or abnormality of the nervous system”, which is not a very helpful definition. We think of neuropathy as any damage to the nervous system. Peripheral Neuropathy (PN) is the term used to describe disorders of the peripheral nerves. Even though 10 to 20 million people in the US suffer with PN information is hard to come by. Approximately 50% of diabetics will develop the condition. Neuropathy means “disease or abnormality of the nervous system”, which is not a very helpful definition. We think of neuropathy as any damage to the nervous system. Carpal Tunnel Syndrome, Herniated Discs and Strokes are all insults to different areas of the nervous system, all with different symptoms. Diabetes is a systemic disease that affects all nerves of the body from the brain, eyes and small nerves of the heart and digestive system, to the nerves in the hands feet and legs. Peripheral nerve cells have three main parts: cell body, axons, and dendrites (nerve/muscle junctions). Any part of the nerve can be affected, but damage to axons is most common. The axon transmits signals from nerve cell to nerve cell or muscle. 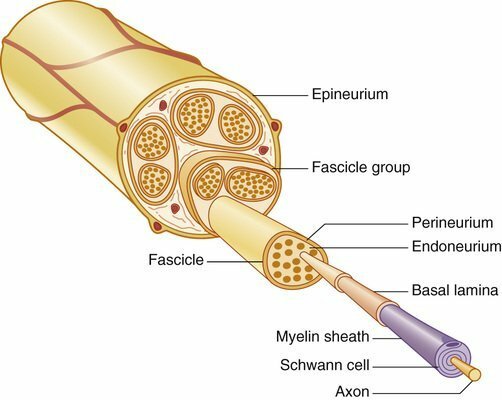 Most axons are surrounded by a substance called myelin, which facilitates signal transmission. There are two types of symptoms with peripheral neuropathy; negative and positive. Negative signs of Neuropathy, which come first, are when damage to the nervous system, obviously, brings about LOSS of a particular function. These are rarely detectable to the patient, because the brain makes up the difference in these losses. This too is a reaction of the brain and nervous system, unfortunately this overreaction tears apart the fiber of patients’ lives. Each patient will describe their pain in their own individual language of ‘pain’. This can easily confuse a doctor not trained in the recognition and treatment of these patients. So the patient usually continues to suffer, going from doctor to doctor, to stronger and stronger doses of pills until they are either completely drugged up and out of it, or lost in their own world of suffering. Some neuropathies come on suddenly, others over many years. Some people are affected only by a weakness in the legs which leads to difficulty standing, walking, or getting out of a chair. The loss of sensation from the feet, ankles and toes contributes to patients not having a ‘good sense’ of where there feet are in space, touching the ground, and this causes them to fall very easily. These under-recognized sensory losses CAN ONLY be detected with the proper clinical exam. This office has the necessary tools to uncover the underlying cause of this ’silent’ nerve damage. Some patients will eventually become unable to walk at all. Others start with a tingling, pin pricking feeling that turns into deep sharp stabbing pains and burning electric shocks. These debilitating problems can also be at their worst at night while trying to get to sleep, because the PAIN never goes away. In fact, once started IT ONLY GETS WORSE!! Currently, ordinary medicine has no cure for PN at this time. The extremely powerful drugs dispensed to patients do NOT TREAT the NERVE DAMAGE! They numb the brain to numb the pain. Most patients can not tolerate a drugged existence but feel they have NO OTHER OPTION against this horrifying pain. INCREASE CIRCULATION in the feet and toes! INCREASE OXYGEN delivery to the feet and toes! PROMOTE HEALING in the end of the nerves due to the increase in Nitric Oxide delivery and ATP production. PROMOTE FUNCTION of the nerve receptors! What does this mean? THE NERVES START TO HEAL! Begin Relieving your Neuropathy Pain!